How does a state, tarnished with a racist, violent history, emerge from the modern civil rights movement with a reputation for tolerance and progression? Old South, New South, or Down South? : Florida and the Modern Civil Rights Movement exposes the image, illusion, and reality behind Florida’s hidden story of racial discrimination and violence. 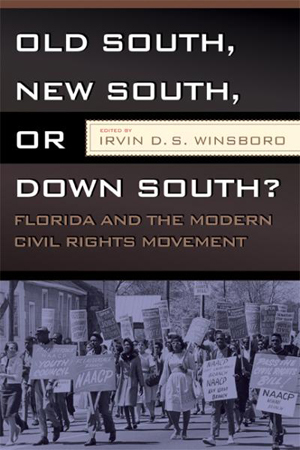 By exploring multiple perspectives on racially motivated events, such as black agency, political stonewalling, and racist assaults, this collection of nine essays reconceptualizes the civil rights legacy of the Sunshine State. Its dissection of local, isolated acts of rebellion reveals a strategic, political concealment of the once dominant, often overlooked, old south attitude towards race in Florida. Irvin D.S. Winsboro is professor of history, African American studies, and Florida studies at Florida Gulf Coast University. He is the author of Feminism and Black Activism in Contemporary America: An Ideological Assessment, and numerous other works and articles. Contributors Include: Abel A. Bartley, Gregory Bush, Marvin Dunn, Leonard R. Lempel, Connie L. Lester, Paul Ortiz, Amy Sasscer, Lise M. Steinhauer.